There were a good 20 excellent albums in the first 8 years of the 21st Century, but very few people would deny that the amazing creative momentum of the 1990s ran into a brick wall in early 2001. Attesting to the decline in the Havana scene is the staggering list of brilliant musicians who have left the island: Manolín, Issac Delgado, Danny Lozada, Yoel Páez, Joel Domínguez, Juan Carlos González, etc. etc. 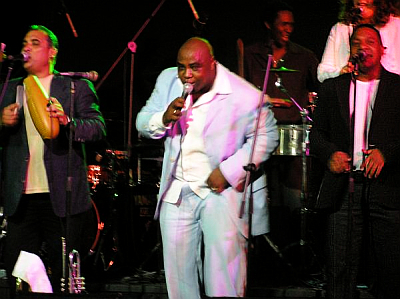 Havana d'Primera was formed on October 4, 2008 by a collective of the best musicians of the 1990s -- those who refused to throw in the towel -- in an attempt to rekindle the magic of timba and create a better working environment for musicians. Their debut album, Haciendo historia, and a string of riveting performances, have caused more buzz than any new band since Pupy y Los Que Son Son. The band is directed by Alexander Abreu, widely recognized as the greatest trumpeter of his generation -- a key part of Paulito FG's Élite during its glory years and the first call studio trumpeter for everyone from Juan Ceruto to Juan Formell to Issac Delgado. There had always been rumors of Alexander's behind-the-scenes creative contributions in the form of coros and mambos, but he's now come front and center as a dominating lead vocalist and songwriter. His voice is reminiscent of Robertón but with the added melodic sophistication of a skilled instrumentalist. His writing and arranging are brilliant. Every musician is an all-star -- from pianist Tony Rodríguez to conguero Guillermo del Toro to to corista Enrique "El Gordo" Pérez to trombonist Carlos Álvarez.